When your iPhone is stuck and not recognized in iTunes, you need to put it into recovery mode to restore it and get it working again. Sometimes you just need to get your iPhone/iPad into recovery mode for jailbreak purposes. In other times, you are wondering how to get an iPhone out of recovery mode loop. In this article you'll get all details on how to enter and exit recovery mode on iPhone/iPad/iPod touch. You've installed an iOS update (such as iOS 11 beta, iOS 10.3.3/10.3.2/10) and your device gets stuck in a continuous restart loop. This can happen when something goes wrong with the update/downgrade, or when you have extremely low battery life while installing the update. You try to update the OS or restore the device from backup, the process didn't complete, and now iTunes doesn't register the device when you connect it to your computer. The silver Apple logo has been onscreen, with no change, for many minutes. 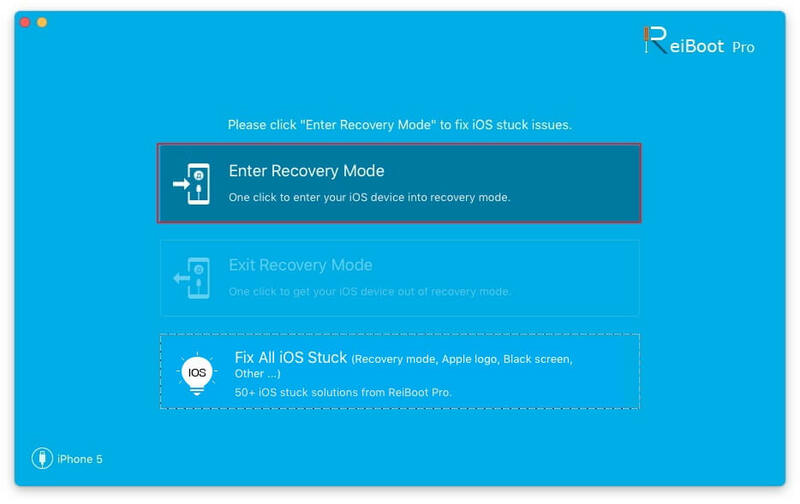 You can either get your iPhone/iPad into recovery mode manually or by using a free tool – Any iOS System Repair (ReiBoot). Method 1. Enter into iPhone recovery mode by hand. Step 1. Connect the USB cable used to sync your device to your computer, but do not connect it to your iPhone. Step 2. 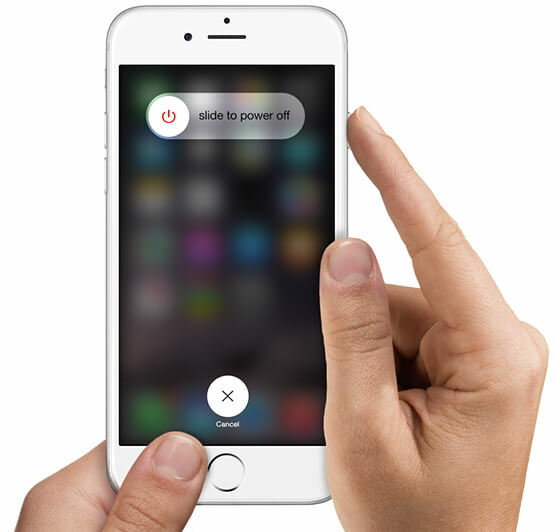 Turn your iPhone off by pressing and holding the Sleep/Wake button until the slider appears. Drag the slider to turn your device completely off. Step 3. When the phone is off, press and hold down the Power/Sleep button and Home button (Volume Down button for iPhone 7 and iPhone 7 Plus) at the same time until the iTunes logo/USB cable appears. The phone is now in recovery mode. Step 4. If the red empty battery icon appears onscreen, let the phone charge for a few minutes and then restart this process. When the phone is in recovery mode, a window will pop up in iTunes saying that the phone is in recovery mode and needs to be restored. You can either restore it to its factory state or from a recent backup of your data. Manually getting your device into recovery mode seems somewhat complicated for beginners. Any iOS System Repair (ReiBoot) is the best tool to enter into recovery by one click. It works for all iOS 11/10.3.3/10.3/10/9/8 devices including iPhone 7/7 Plus/SE/6s/6s Plus/6/6 Plus/5s/5/4S, iPad Air, iPad Pro, iPad Mini, iPad and iPod touch. Run Any iOS System Repair (ReiBoot) on PC/Mac and connect your device to computer with USB cable. Click Enter Recovery Mode option, and wait for 10 seconds around. Done! Your device is now in recovery mode. Super easy and fast. You can get rid of recovery mode before deleting your data and restoring your phone. To do so, unplug the device from the USB cable. And you can exit recovery mode by doing the steps below if your device was working properly previously. 1. Hold the Power/Sleep button and Home button (Volume Down button for iPhone 7 and iPhone 7 Plus) for about 15 seconds. Then the iPhone will shut off. 2. Let go Home button (Volume Down button for iPhone 7 and iPhone 7 Plus) and hold power button to boot up iPhone. Tips: Any iOS System Repair (ReiBoot) is also recommended to exit iPhone recovery mode with just one click. When your iPhone is stuck on recovery mode, just connect it to computer and run Any iOS System Repair (ReiBoot). The "Exit Recovery Mode" option is highlighted. Click this button and wait for a few seconds. Your device is now ticked out of recovery mode stuck. DFU (Device Firmware Update) mode is a means to getting your iPhone to interface with iTunes without iTunes automatically loading the latest version of iOS onto it (it skips the iBoot bootloader, for jailbreak aficionados). However, iPhone recovery mode is where iTunes restores your iPhone to its original factory settings but with the latest iOS and firmware. For more information on DFU mode you can visit How to Enter DFU Mode for iPhone, iPad and iPod. iPhone recovery mode may not solve all your problems sometimes, and the issue is more serious than we estimated. As the recovery mode has deleted all our iPhone data, we need to find another way out. The best way to enable us to restore from iPhone backup is using iTunes Data Recovery. The easy-to-use software allows us to recover photos, contacts, SMS, notes and more from iPhone backup.